← When is it time for new windshield wipers? 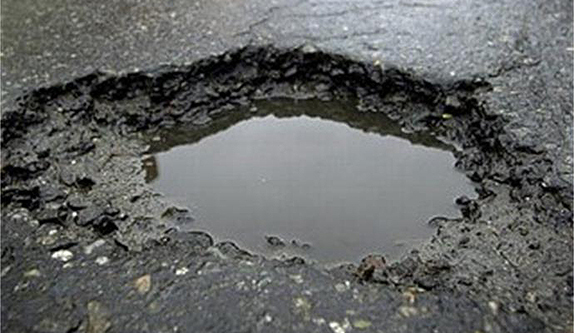 Every year over 3 million potholes nationwide will appear and be reported. They will cause millions of dollars in damage to your car and cost millions of dollars for DOT teams to fix. I don’t know about you, but it feels like every year my car hits every single one of those 3 million potholes. Each impact is a teeth-jarring wallop to my tires, rims, balance, alignment, and shocks that will leave my car a rattling hulk of what it once was! Potholes are caused by the expansion and contraction of ground water after the water has entered under the pavement. When the water freezes, it expands. The frozen water will take up more space under the pavement, and the pavement will heave, expand, bend, and weaken. When the ice melts, the pavement contracts and leaves gaps in the surface. Water gets into these voids and when water freezes and thaws again, the pavement will weaken further and crack. As the weight of cars and trucks pass over this weak spot, pieces of the roadway material weaken more, which will cause the road material and substrate to be displaced or broken down further thus creating the pothole. When salt is brought into the picture the pothole effect will get worse. Water will freeze at 32 degrees Fahrenheit. But when salt is used, it lowers the temperature that water will freeze at. This creates an artificial freeze-thaw cycle that permits more occurrences of the damaging cycle outlined above to occur. Potholes can happen on any road surface but tend to happen more along the edges and shoulders of roadways than in the center of them, they also tend to occur more in asphalt than concrete surfaces since they tend to be more porous. Ok science class is over; economics class is now in session. Koons is very aware of the fact that your car will inevitably come in contact with these pesky “craters” this winter. We know your car is your baby and you can’t stand the idea of it being hurt, so Koons Service is here to help. 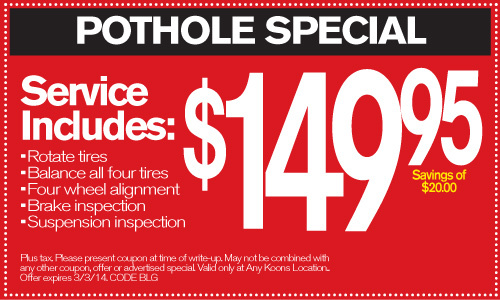 If you’ve recently had a run in with one of these bone rattlers, make an appointment with us, show the technician this coupon, and let them to do the rest. Afterwards you will drive away knowing that your car is in better shape than when you dropped it off and it is definitely capable of handling whatever the road may throw at it. Posted on January 23, 2014, in Automotive, Marketing and tagged Jim Koons, Koons, Koons Automotive, safety. Bookmark the permalink. Leave a comment.